While strolling through Fremont a few days ago I noticed that the Theo Chocolate retail showroom was nearly deserted – that had not been true the last few times I’d tried to take a look around. So I jumped at the opportunity to go in and actually have a chance to see all they offer. The showroom is pretty sparse. It’s located in the old Trolleyman Pub location. The Trolleyman was part of the original Red Hook Brewery and remained open for quite some time after the brewery moved to Woodinville. In recent years, however, the facility has been claimed by Theo Chocolates for both their factory and this little showroom. What’s odd about the showroom is that they left it pretty much as it was when it was a pub! So there is a fireplace (complete with fire on this day) in one corner, lots of cozy couches and chairs placed near the fireplace and then the chocolate showcases replace what was the bar. Since their line is not huge the showcases are rather sparse showing off a couple dozen types of interesting chocolate bites and their line-up of chocolate bars. The whole effect is a bit unbalanced and pseudo-industrial to be quite honest but when you are just there to pick up a bit of amazing chocolate it doesn’t make much difference, I guess. On this day I was actually able to make my way to the confection case. This is the case I’d been trying to get to for several months! In this case you will not find the usual truffles, nut-studded chocolates and nougats but amazing and interesting blends like rose caramel, Merlot pine nut, ginger, damiana, licorice and hot Ceylon cinnamon. The names alone are enough to cultivate pictures of exotic and far-flung lands. 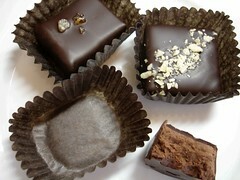 I selected half a dozen to take home with me and then moved to the area with the chocolate bars. 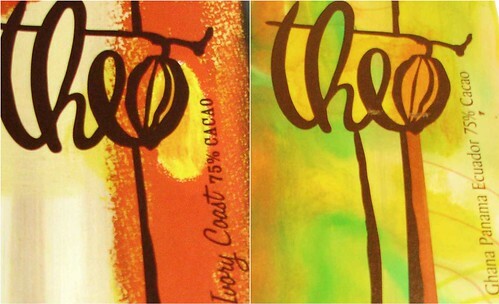 All of Theo’s chocolates are organic and Fair Trade certified. The bars that I find most appealing are those in their Origins line. These bars are each from a different part of the world and range from from 65 – 91% cacao content. 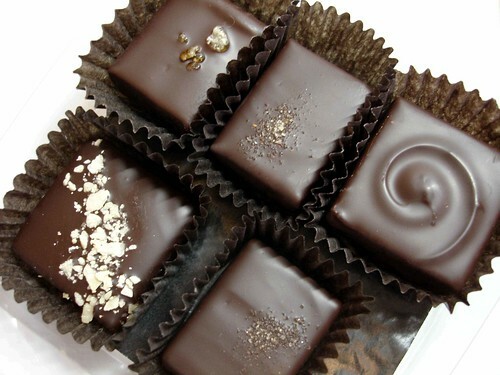 This is dark chocolate at its best! The concept is very similar to Richart’s Tasting Collection, which I adore! I selected two bars that are each 75% chocolate – at that percent I can sneak a bite or two just for a little treat or this chocolate could also be used for baking. One bar is from the Ivory Coast and the other from Ghana-Panama-Ecuador. I haven’t yet done a side by side taste test but will be doing that in the near future. They also make a line called the 3400 Phinney line (their address) which I have mixed feelings about. I guess in general I don’t really care for chocolate bars with "stuff" in them and this line is either flavored or augmented in some way. So while there are a couple I find delightful, this line is not really my cup of tea – or I maybe I should say my cup of cocoa. But you might find them amazingly delicious! If you are in the Seattle area I recommend that you make a trip to the showroom at some point. They actually do tours, also, but I haven’t checked that out. If you are not in Seattle, they do mail-order business from their site. ← A Special Little Wino….